Each season has its own flavours and in summer we are particularly spoiled. Mangoes are for me sun in a skin. Peaches and cherries are Christmas. But summer, summer is sun warmed tomatoes and basil. Each year I transform our tiny veggie patch into a tomato oasis, under planted with basil. And when it is full of sun warmed, perfectly ripe tomatoes I just love to make my version of the Italian bread salad, panzanella. 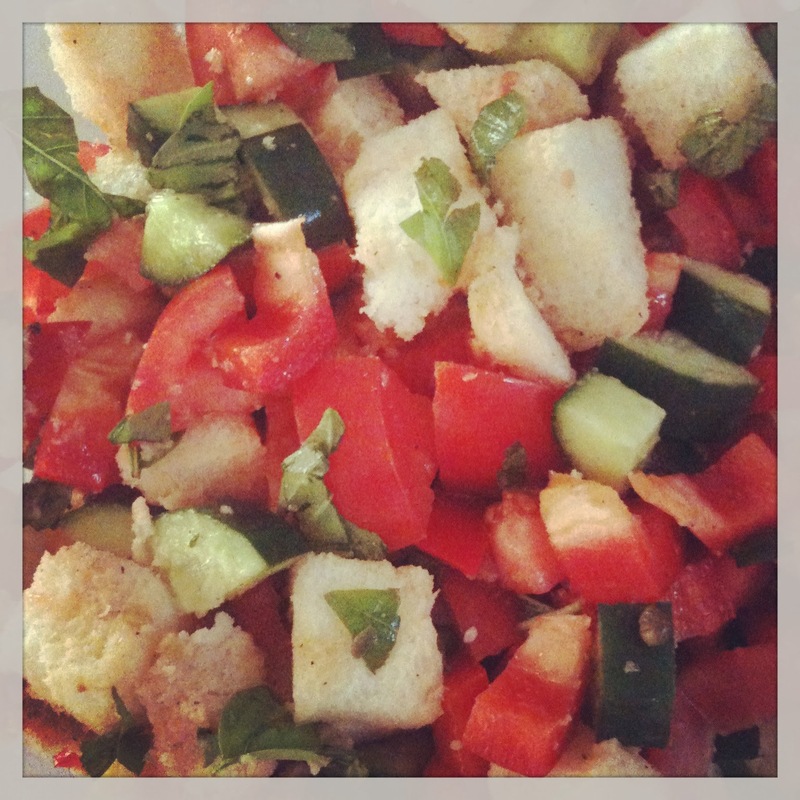 Traditionally panzanella is just bread, tomatoes and basil with a simple dressing. You use stale bread which you soak in water and squeeze out before making the salad. However, I like to add a few extra veggies and prefer my bread a bit more solid so skip the water step. I like to make this with a sourdough or Italian style bread. I recently made it with an olive sour dough and it was especially great. This is not a traditional recipe but I think it is yummy. It goes really well with a simple steak or sausages, or just on its own. Cut or tear the bread into roughly 1cm cubes. Cut up the tomatoes to an equal size and add to the bread (along with any juice that comes out when you cut them up). Roughly tear up the basil and cut up the cucumber and capsicum to similar size as the tomatoes. Drizzel with dressing and toss to combine. To make the dressing combine all ingredients in a screwtop jar and shake. This salad is best made at least 15-30 minutes before eating so that the flavours have time to meld.